Memphis is ranked 58th out of 71 most literate cities in a 2008 study conducted by Central Connecticut State University. This is based on the community’s number of bookstores, the number of libraries and the rate of circulation, residents’ book purchases through online sites, number and circulation of local newspapers and magazines, and percentage of citizens with a bachelor’s level education. In this case, 58 is not a number that Memphians should be proud of. Perhaps not reading literate, we are however literate in the arts, music, theater, fine craft and fine food. Memphis thrives in all of these areas. If anyone ever picks up a newspaper around here, they’ll see pages and pages of music venues, theatre and ballet performances, fine restaurants representing a global diversity and of course, my personal favorite — galleries, shops and fairs representing the growing number of fine craft artists in the Memphis area. 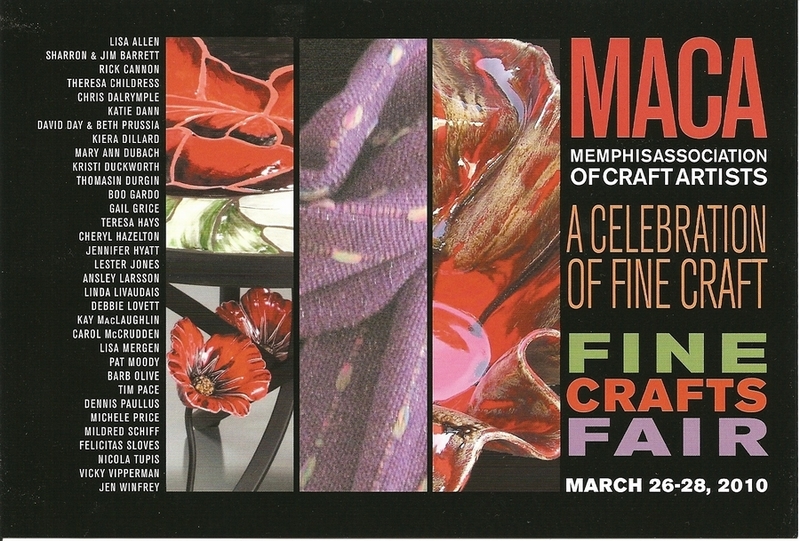 This weekend, March 26 to 28, Memphis Association of Craft Artists in conjunction with Christian Brothers University will be having their second annual “Celebration of Fine Craft”. Over 35 area artists will be showing and selling their work in a variety of media including clay, wood, glass, metal, jewelry, paper and fiber. If you are in Memphis, please plan on joining us for our opening reception Friday evening (March 26) from 5:00 to 9:00 in the Canale Arena on the campus of Christian Brothers University. Artists will be selling their work at the reception and then again on Saturday, March 27 from 10:00 AM to 6:00 PM and Sunday, March 28 from 11:00 AM to 5:00 PM. And if you are visiting my booth, I will be selling books! 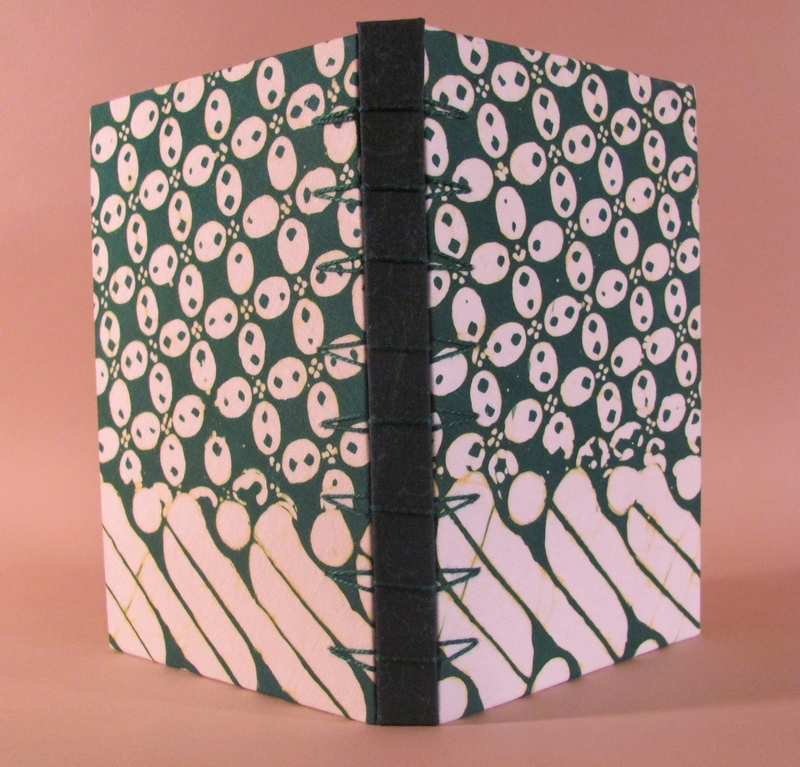 Yes, hand bound books whose covers and pages are hand cut and then covered with hand printed batik fabric from Indonesia. Though Memphians may not be writing in these books according to our less than illustrious #58 ranking among literate cities, they may sketch, draw, or paint in them. Use the pages to glue theater ticket stubs, attach photos of local bands, stick wine labels on them, copy recipes, jot down those elusive and growing computer passwords. Just to list a few ideas…because my books are empty! So, as the title says, “Don’t Judge A Book By Its Blank Pages”. Same goes for Memphis. 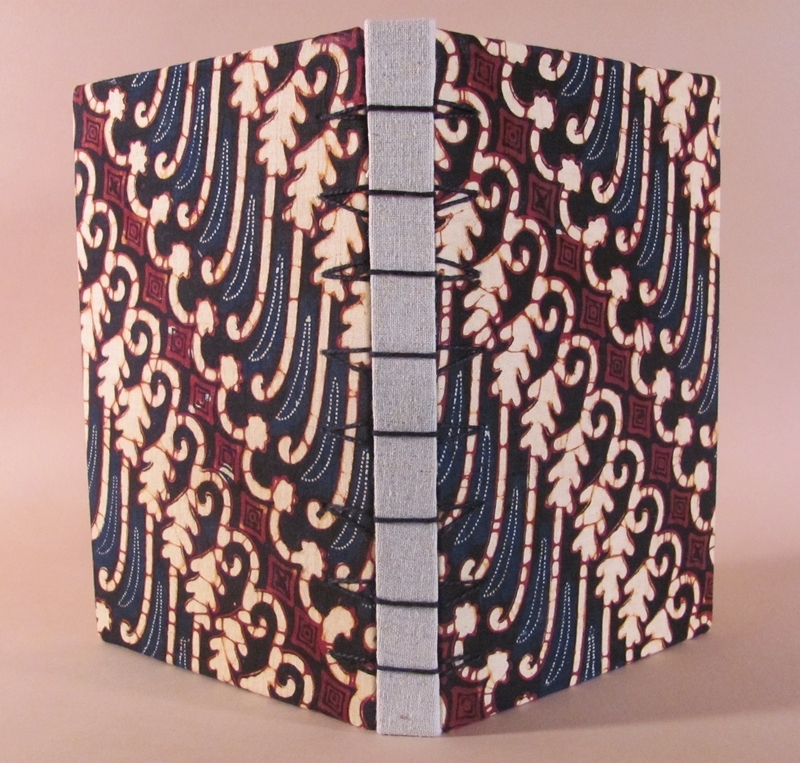 Handbound book bound in "Belgian Secret Binding" , hand printed Indonesian batik fabric cover. 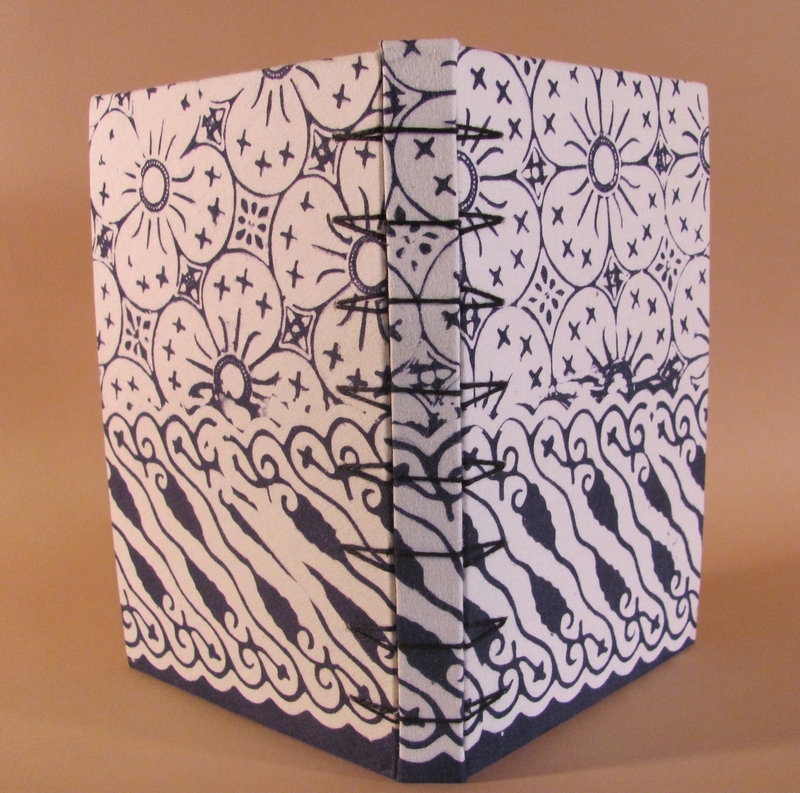 All of the above books are bound in a technique known as “Belgian Secret Binding” which is widely attributed to one my instructors, book conservator Hedi Kyle. 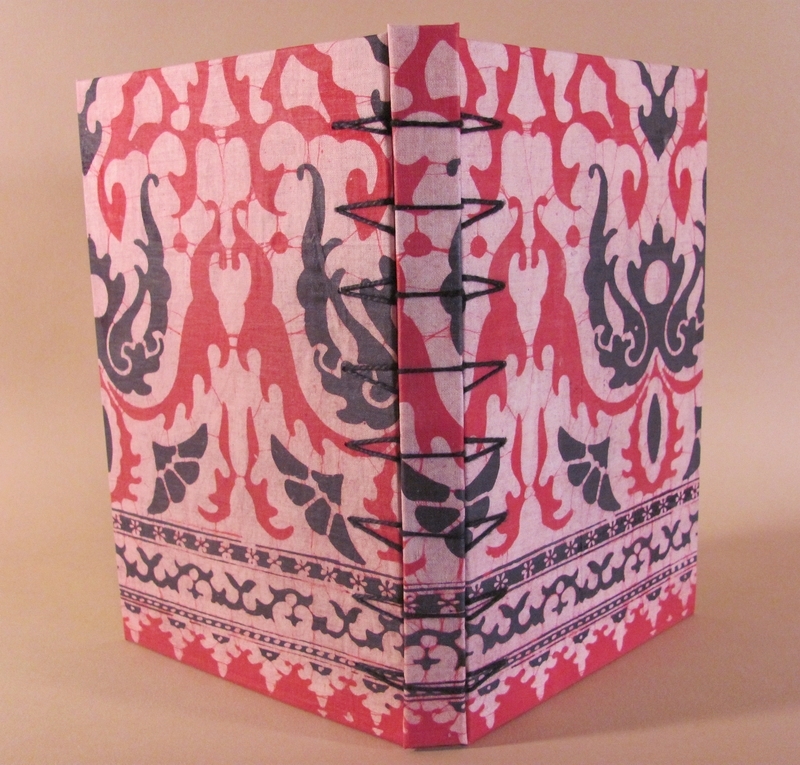 Apparently this binding is a traditional and historic bookbinding technique which had been lost for many years, and in her research, Hedi was able to recreate it and share it with her students. 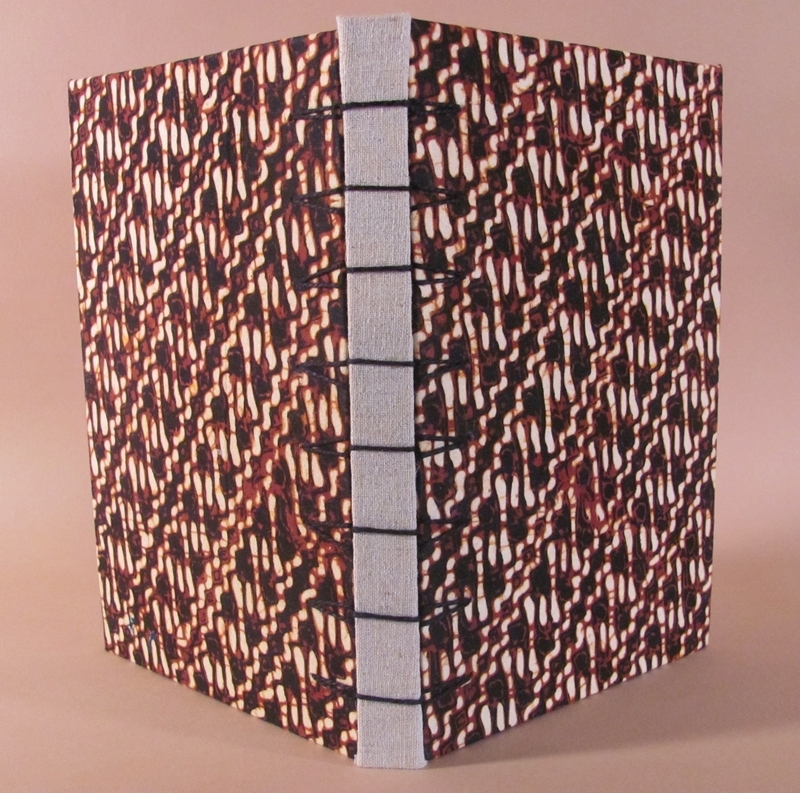 It is one of my favorite binding techniques because the process is similar to weaving. The book pictured below is bound in an ancient technique known as “Japanese Stab binding”. 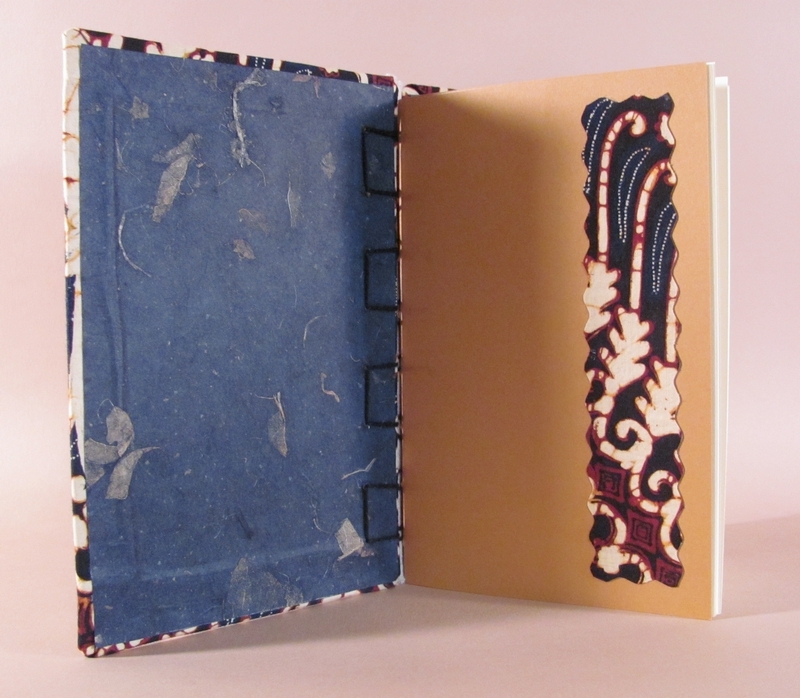 This book is covered in dupioni silk with a decorative handprinted Indonesian batik fabric layered on top. The coins are from Thailand. Don’t be disappointed just because the pages are empty! 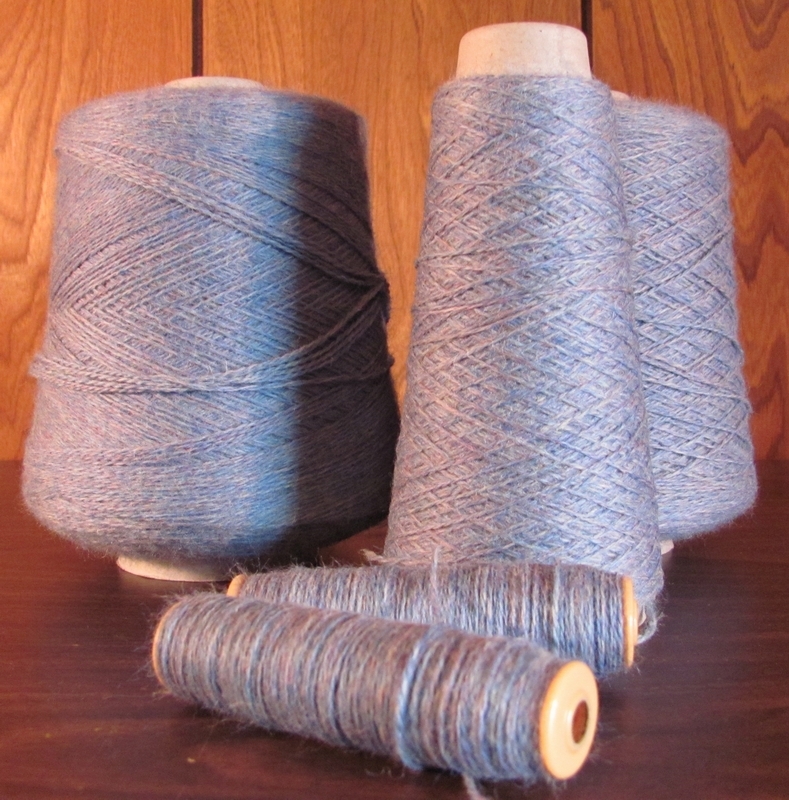 You thought I was going to write about weavers who get a “rush” from working with the fiber of their choice, right? Wrong. I am going to tell you about a product called fiber rush. It is a twisted paper cord used mostly to weave chair seats. It comes in a variety of diameters from the smallest 1/32″ to the largest 6/32″ and it comes in brown, gold or white. 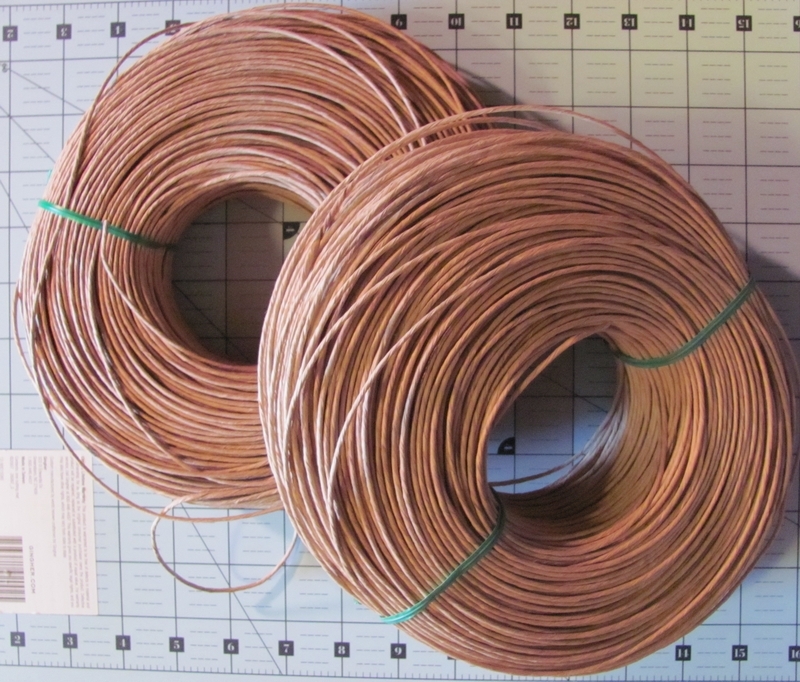 I purchased two – 1 pound coils of the smallest sizes #1 and #2. 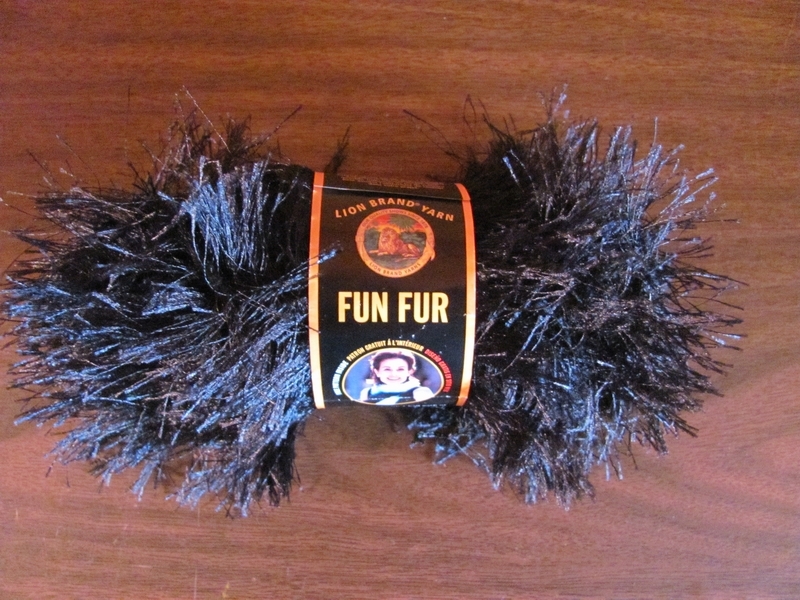 The baby fiber rush as it is often called can be used as a core in coiling baskets and also for small wicker furniture. I found this at Royalwood Ltd. a source for basket weaving and seat weaving supplies. They are in Mansfield, OH and I also order Irish Waxed Linen thread from them. 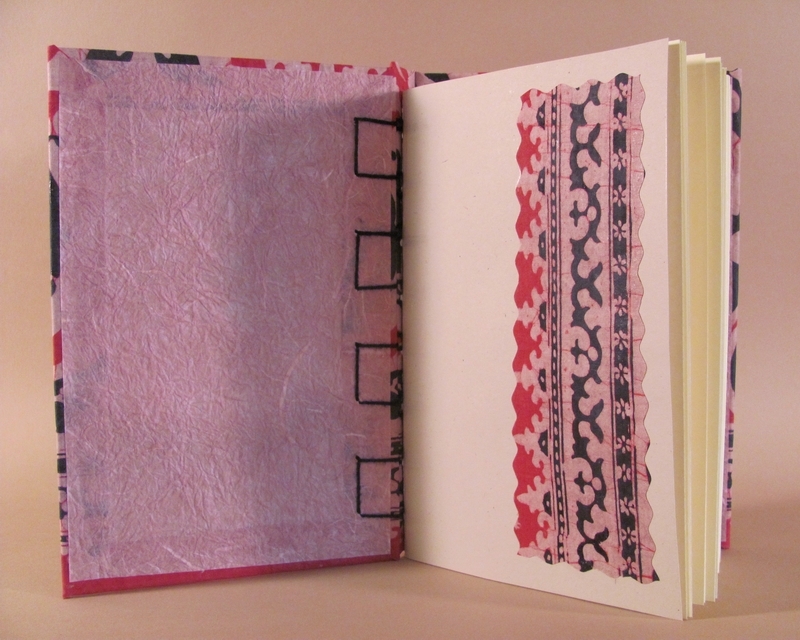 I use the thread for bookbinding. My previous experience with basket weaving was not a pleasant one, and so that was not my intention with the fiber rush. I was looking for a stiff material that I could use as weft in a rep weave pattern. I had previously tried weaving with wire but I did not like working with the constantly kinking, curling and twisting wire. Three dimensional weaving had always intrigued me and I was curious as to how I could weave a bowl or vase on the loom. The #2 baby fiber rush seemed more stiff than the #1 and thus more suitable to my idea of the final product. I wound a bunch of the rush around a stick shuttle. 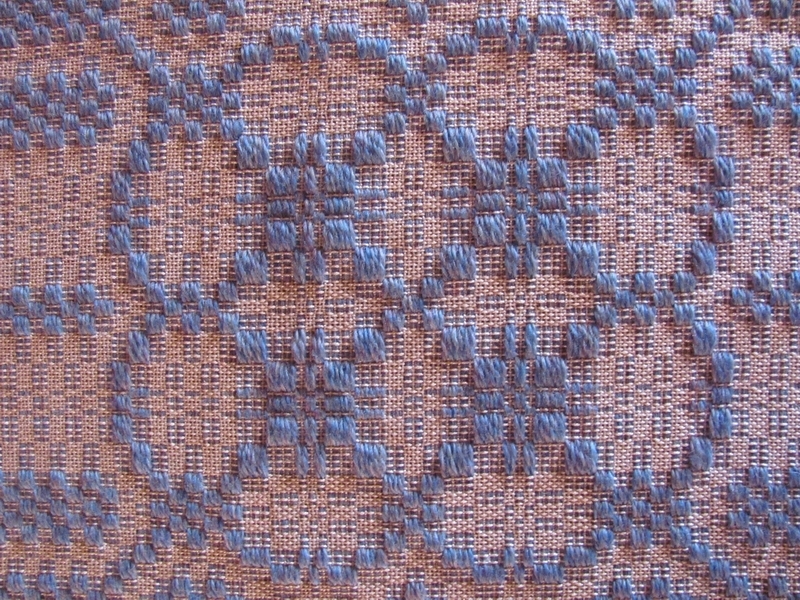 The rush would be the thick rows of weft to create the dominate weave pattern. 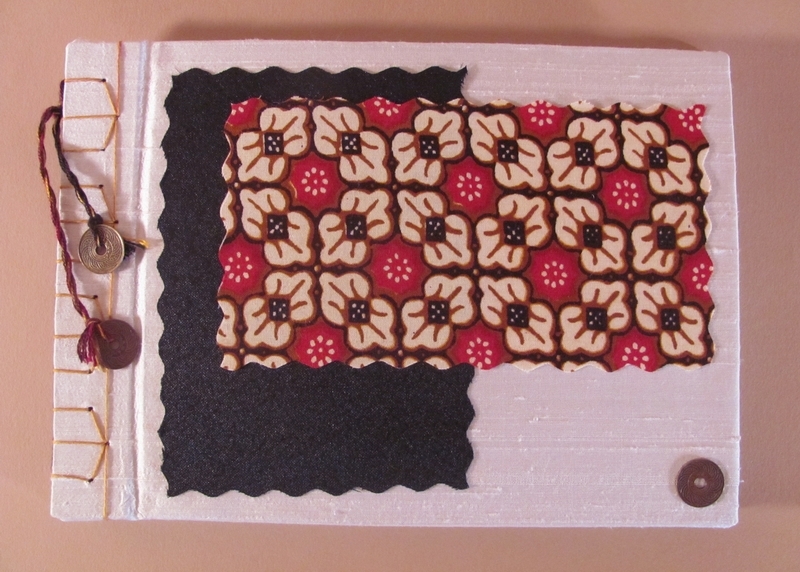 For the alternating thin rows, I used a spool of sewing thread which I simply inserted onto the shaft of a boat shuttle. Using the thick and thin wefts, I wove the way I would normally weave a rep weave pattern. This is how it looks on my loom. My warp is 3/2 perle cotton sett at 30 epi. I blended various shades of blues and yellows together so the pattern wouldn’t look so flat. This was a recommendation by Joanne Tallarovic in her book Rep Weave and Beyond. In fact the above pattern was inspired by her “Circle of Life” sash on page 78. The fiber rush in the thick rows can only be seen at the selvages of the woven fabric. 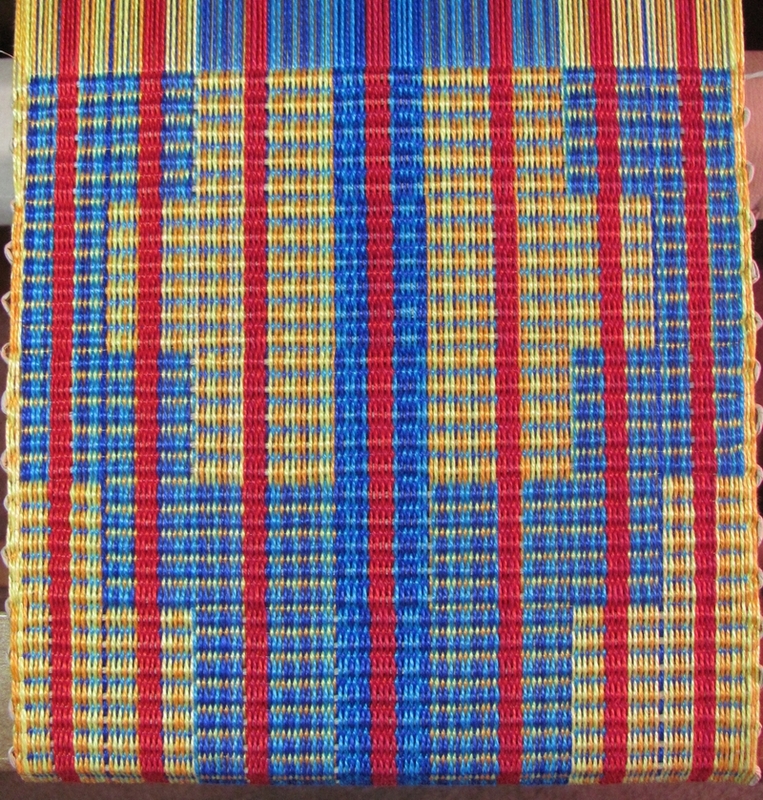 Once this piece is off the loom I will try to sew it into a basket. I wove two same sized and identical pieces that I will lay flat, one centered and perpendicular to the other one on the bottom. Then I will fold up the sides and hand sew the corners where they meet. I will also sew the open ended selvages on the bottom edges of the “basket” and perhaps insert a square of mat board if the piece is not stiff enough. The actual fabric is not as stiff as I had intended, so I don’t know if this will even work. 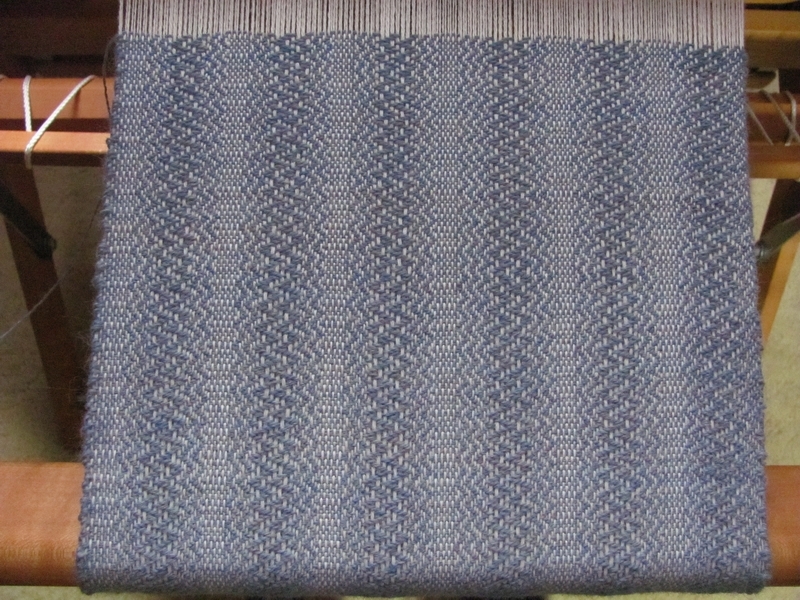 I have also woven some extra pieces on this warp, so if all else fails, I will at least have some rep weave pieces that I can use as book covers. My inspiration comes from my stash. And when I was looking for some textured yarn without leaving the comfort of my home weaving studio, I found this. My thought was to use a little of this as accent yarn in the warp with 10/2 perle cotton. Of course, this was a mistake. The hairy characteristics of this “eyelash” yarn made the weaving process a slow and painstaking task which is not ordinarily the case with my weaving projects. And to add insult to injury, I was only a few inches short of the end of the scarf, when I ran out of the bamboo yarn I was using as weft. Luckily, I had a new full cone of the same color, but having ordered the yarns on two separate occasions, of course the dye lots were different. Yes, even with a bleached white yarn, this makes a difference. My solution was to dip the finished scarf in a bath of green tea to give it an “antiqued” look and so masking the different shades of white. After the usual finishing of a quick soak and swirl in mild detergent and spin drying in the washing machine, I gave it a go. I added 20 green tea bags to boiling water in a large stew pot. I let the tea simmer and steep until the water was moderately warm, then removed the tea bags. I placed the still wet scarf in the pot and moved it around a bit, then let it sit overnight. Didn’t fret over it. Had a nice cocktail before bed and slept like a baby. I was just expecting a softened creamy color, not a harsh brown so I hadn’t added any salt to the tea. (My understanding is that the addition of salt before dyeing would break down the fibers a bit and thus allow the fabric to more readily accept the dye.) And a soft creamy color is what I got the next morning. After emptying the tea water, I rinsed the scarf a few times until the water was clear. In the last rinse, I added a bit of white vinegar and a couple of drops of mild dishwashing liquid. The vinegar to set the color and the soap to remove any telltale vinegar odor. One more round in the washing machine’s spin cycle and the scarf looked great as it hung to dry. 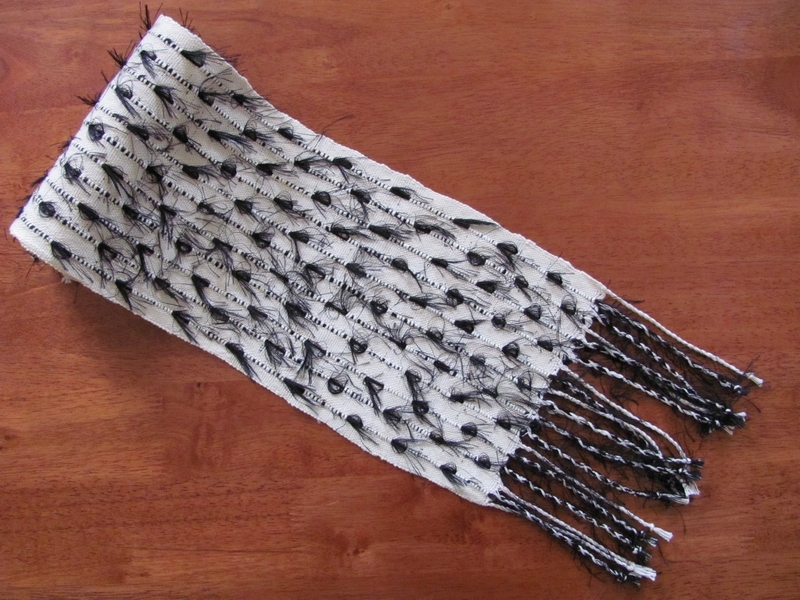 The finished scarf looks like a hot little “shabby chic” number – an accessory for an “urban distressed” outfit. And, yes, the green tea dye completely covered any discrepancy in shades of the white bamboo yarn. Success!